Back to the Whites again, and so soon! 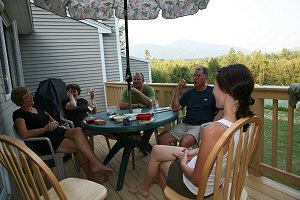 The occasion of this particular visit was Luke and Sophie's invitation for us to stay at a condominium they had rented for four days with Luke's parents in North Conway, NH. Accepting their generous offer, we headed down for a bit of visiting, and then the next morning we'd all hike a peak in the Whites before heading back to Ottawa. We were taking the S2000 this time, so I charted a backroads course that avoided the morass of Montreal traffic (we crossed at Salaberry-de-Valleyfield - the only bridge crossing the Saint Lawrence upstream of Montreal). 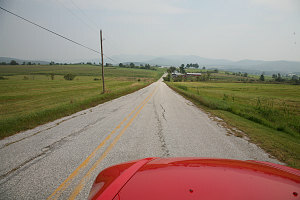 It was a hot and hazy day, and there were times where it was too warm to drive with the top down. We crossed at a very small and quaint border post on the Quebec / Vermont border. A much nicer experience than the big and impersonal main crossings. The drive through northern Vermont was pleasant, as always, and we had the added bonus of being waved-at by innumerable schoolkids in buses, as they were trucked home at the end of the school day. 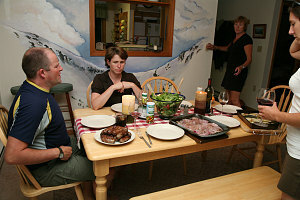 Luke and Sophie's rental condo in North Conway, Northbridge Condominiums, was a pleasant tucked-away-in-the-woods sort of place. Spacious and well-appointed, it had more than enough room to accommodate us two extra people. 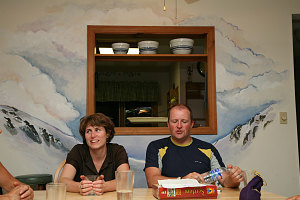 The interior had a very curious wall-mural of Tuckerman's Ravine on Mount Washington, with hundreds of spring skiiers dotting the snow. 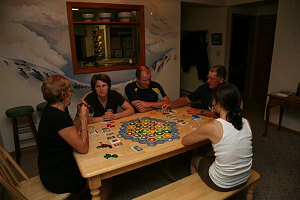 After a hearty dinner (thank you to all how bought, cooked and cleaned), we played a game of our favourite strategy game, Settlers of Catan.